Today I wanted to do something fun and different, so I decided to head down to Marwell for the day. Well I planned to do that, in fact I didn't arrive until about 3pm, so it was a little rushed, but I did manage to get some nice photos. The main thing I have learned is that I have no idea how to use my camera. Too many of the photos are out of focus. 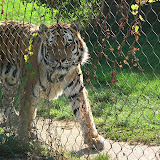 Mainly because the camera focused on the fence wire, rather than the animal. I still managed to get some good photos, but I could have had so many more. Fortunatley my sister has a photography degree so I should be able to get some advice from her. Ready to try your luck here? Probably not. I don't think my photos are good enough to compete against those. Although it would be amusing if a photo taken by a "cheap" instant camera beat out ones taken by a digital SLR. I like your blog. I was looking for an update on whether you've managed to stick to being a vegetarian, or whether you have given in to meat again. We are managing to only eat meat 2 or 3 times a week now, which is good. There are a lot of tasty veggies recipes out there.